This one reminds us of the Big Bad Wolf dressed up in Granny's nightgown... a 425 HP 426 Hemi V8 under the hood of a 1966 Plymouth Belvedere II convertible wearing color code 661 Metallic Mauve. Yeah, it's pink. And yeah, it's a baaad machine! Plymouth made 10 '66 Belvedere II Hemi drop-tops, 6 automatics, and only one in this color, making this one of the rarest Mopars in the Brothers Collection. It's been perfectly restored, but it still features its original driveline. And because it's a 1 of 1, it's been restored to it's original Metallic Mauve. Would it be more fun in black or red? Who knows, but we wouldn't turn it down! 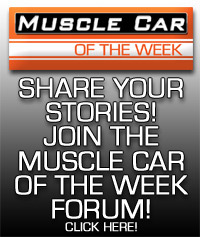 We've featured some pretty rare cars on Muscle Car Of The Week, and this one tops the list! This 1969 Plymouth Road Runner convertible would be cool with any power plant, but the fact that the Air Grabber hood is hiding an original 425 HP 426 HEMI V8 coupled to a 4-speed transmission makes this one of the rarest 'Runners out there! Reports claim 10 of these cars were equipped with the 426 HEMI in drop-top form, and only a couple are said to exist today. This F8 Green monster was featured at the 2013 Muscle Car and Corvette Nationals in the Road Runner Invitational display and is one of the prized Plymouths in The Brothers Collection. Dodge Muscle Cars came in a wide variety of crazy colors back in the day... come to think of it, they do now, too! This 1970 Dodge Challenger T/A is a great example of an awesome car in an over-the-top color. The Challenger T/A was the Trans Am race car for the street. It featured a beefed-up 340 V8 with a stronger block, special cam, free-breathing heads, and the super cool 6-Pack triple carb setup. The car had racy styling cues from bumper to bumper, and although they claimed 290 HP, these were potent performers embarrassing many cars with much more under the hood. However, the most notable feature on this example from the Brothers Collection is the paint code FM3, Panther Pink. This 1970 Dodge Super Bee is not the car you want to drive if you don't like attention. This Top Banana Yellow example from the Brothers Collection is not only visibly noticible thanks to the bright color and white interior and stripes, but the 440 6-Pack under the hood causes a stir on the street anywhere you go!